Big Tex Randall, Canyon, Texas. Highway 60 and 15th Street � you can�t miss it. This relic from the golden age of oversized and anatomically incorrect barkers was built in 1959. The sculptor is unknown and it�s possible he requested anonymity. 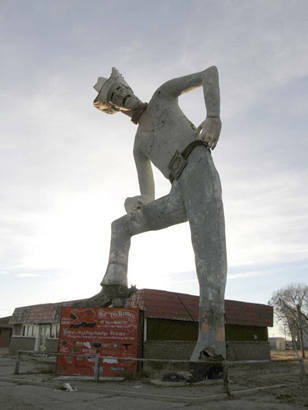 The mustachioed (nearly) 50-foot cowboy with the friendly slouch and a belt buckle the size of a television screen once lured customers to the trading post that occupied the building beneath him. Although his duties officially ended when TxDoT rerouted traffic through an underpass, forcing the business to close, Mr. Randall remained loyal to his hometown, refusing offers from Las Vegas and various businesses alongside Route 66. While the big sandblasted cowboy has been repainted at least once since his installation, his current condition makes the description of �weathered� an understatement. 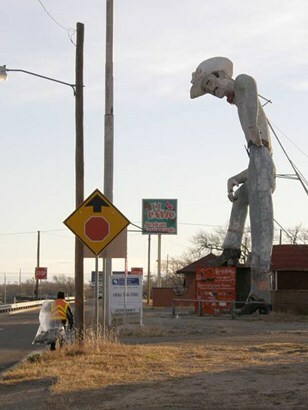 Big Tex Randall might be considered for adoption by a paint company wanting to prove its product�s durability.